Independent Transport Videos are proud to present this archive video presentation of the iconic AEC Routemaster bus running in service with three major operators, and two independents in southern England. 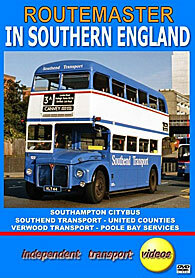 The video was shot by transport photographer Malcolm King in the late 1980’s and features the Routemasters running in service with Southampton CityBus, Southend Transport, United Counties, and independents, Verwood Transport and Poole Bay Services. The programme starts in Southampton. A city well used to the AEC product as they had only just said goodbye to their last open platform AEC Regent V in 1981 – having said that it would often return to traffic at peak time, and is seen on this programme making such an appearance! It was May 1987 that the Routemaster commenced operation in Southampton on a new service, the 16 between the city centre and the Millbrook Estate. The initial fleet of Routemasters consisted of 12 vehicles and were painted in Southampton red with an off white waist band and large ‘CityBus’ fleetnames as well as route ‘branding’ in yellow and black on all available advertising locations being carried on numbers 402-407. Two further services commenced in August with Routemasters, these being the 17A and 23. Numbers 408-413 carried smaller fleetnames and when a further six arrived, 414-419, they were in an overall red livery, also with small fleetnames. Malcolm filmed them in action both in and out of the city, also capturing the contemporary buses of the day from Solent Blueline, Hampshire Bus, Provincial as well as Leyland Atlanteans in the CityBus fleet. Our second location on this programme is Southend. Having hired and borrowed Routemasters in the mid 1980’s it was not until 1988 that Southend Transport decided to purchase its own Routemasters. Services commenced in September 1988 and over their time with the undertaking they covered a number of services, namely the 1, 3A, 7, 9A, 29 and 63. A fleet of 12 were operated in a smart livery of Southend blue, off white with a blue and red stripe. Malcolm visited Southend and captured them operating from the busy town centre bus station and out to the suburbs. We also see other Southend Transport vehicles in action alongside Eastern National ones. The final ‘large’ operator on this programme is United Counties. The first examples took to the streets of Bedford in February 1988 on service 101. They appeared in the ‘deregulation’ livery of ‘Tilling’ green with cream and orange diagonal and horizontal stripe, and were branded as ‘Routemaster’. They also appeared on the 161 route again in Bedford and the 1, 2A, 2C and 4 in Corby. Malcolm caught them in action for you to enjoy. Our final visit is to Poole on the south coast, where we briefly see both Verwood Transport and a ‘hired in’ Routemaster with Poole Bay Services, in action. …….So take your seat and enjoy this nostalgic video presentation featuring the iconic Routemaster running in service many miles away for its natural home in London!